Человеческий фактор классически является самым важным в вопросах информационной безопасности. Процесс повышения осведомленности позволяет снизить воздействие рисков, связанных с этим фактором. Ниже я собрал наиболее известные стандарты и рекомендации по выстраиванию процесса повышения осведомленности. - NIST Special Publication 800-50 - 10.2003 - немного о документе можно прочитать в посте Андрея Прозорова. В самом документе в итоге идет отсылка к NIST, COBIT и ISO 27001. Identify compliance or audit standards that your organization must adhere to. Identify security awareness requirements for those standards. Identify organizational goals, risks, and security policy. Identify stakeholders and get their support. 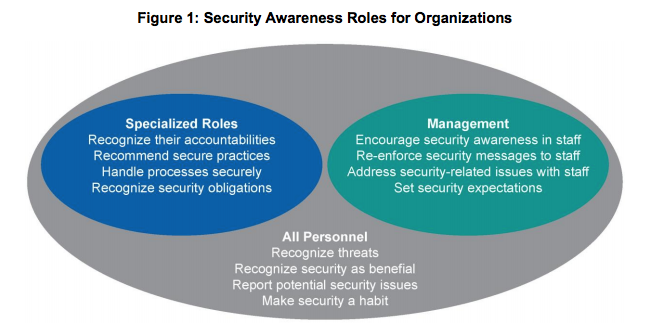 Create a baseline of the organization’s security awareness. Create project charter to establish scope for the security awareness training program. Create steering committee to assist in planning, executing and maintaining the awareness program. Identify who you will be targeting—different roles may require different/additional training (employees, IT personnel, developers, senior leadership). Identify what you will communicate to the different groups (goal is shortest training possible that has the greatest impact). Identify how you will communicate the content—three categories of training: new, annual, and ongoing. Develop and/or purchase training materials and content to meet requirements identified during program creation. Document how and when you intend to measure the success of the program. Identify who to communicate results to, when, and how. Deploy security awareness training utilizing different communication methods identified during program creation. Implement tracking mechanisms to record who completes the training and when. Identify when to review your security awareness program each year. Identify new or changing threats or compliance standards and updates needed; include in annual update. 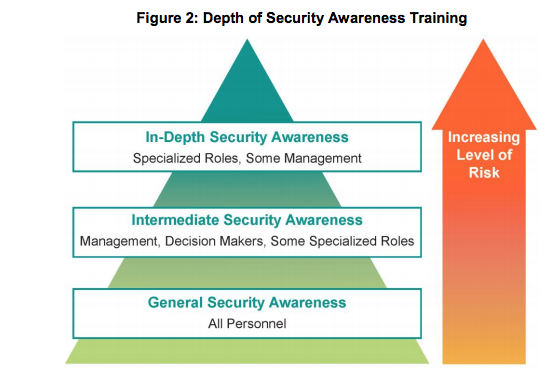 Conduct periodic assessments of organization security awareness and compare to baseline. Survey staff for feedback (usefulness, effectiveness, ease of understanding, ease of implementation, recommended changes, accessibility). Maintain management commitment to supporting, endorsing and promoting the program. Document security awareness program including all previously listed steps within “Creating the Security Awareness Program,” “Implementing Security Awareness,” and “Sustaining Security Awareness.